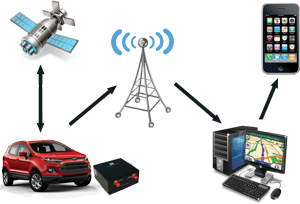 A vehicle tracking system is something that can help people in a variety of ways. It can help parents keep track of where their teen is when taking the car out for a spin, as well as help a spouse know that their significant other has safely reached their destination. It can also be useful for businesses to track a fleet of vehicles so they can know where each individual truck or car is at any given time. These systems have been especially helpful in urban public transportation systems. While most modern tracking systems use GPS technology to locate the vehicle, there are also other kinds of automatic vehicle location technologies that can be used as well. A vehicle tracking system is an electronic device that is installed in a vehicle with computer software that has been specifically designed to enable to a third party or the owner of the vehicle to track the location of the vehicle. Information about the vehicle can be viewed by the use of detailed software or by viewing electronic maps via the Internet. The system also collects other types of data about the vehicle while keeping track of the location. A vehicle tracking system not only keeps track of the location of the vehicle but can also store things such as the speed of the vehicle as well what are known as trigger events. This can include things like the opening or closing of a door or the turning on or off of the vehicle. These tracking systems are basically classified as either "Active" or "Passive'. In a passive system the device is removed upon the vehicle reaching its predetermined destination and then the data is downloaded to a computer to be evaluated. These systems transfer data automatically using wireless download. While an active system also collects the same type of information, the data is transmitted using satellite or cellular networks to a data center or computer in real time. Many of the vehicle tracking systems in use today combine both the passive and active tracking abilities. These tracking systems are very useful for fleets as they can help in the dispatching and routing of the vehicles. By knowing exactly where a vehicle is a company can also choose to reroute the vehicle to avoid traffic jams or to disperse the driver to an alternate destination. They are also very useful for consumers as an anti-theft and retrieval device, making it easy for police to find the stolen vehicle. Some systems even allow for the vehicle to be controlled remotely, which also aids in the security of the auto.